Robert Bradshaw joined LALIVE in 2019 and specialises in international commercial and investment arbitration. He has acted as counsel in a number of arbitrations under the ICC, ICSID and UNCITRAL Rules, applying various procedural and substantive laws both in French and English. He is a member of the ICC Young Arbitrators Forum and the LCIA Young International Arbitration Group. Before joining LALIVE, Robert Bradshaw trained with Hogan Lovells in London (2014-2016) and went on to work as an associate in the firm’s international arbitration team in Paris (2016-2018). 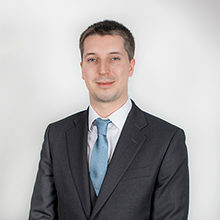 Robert Bradshaw graduated from the University of Birmingham in 2013 with a degree in Law with German, having spent a year studying at the Free University of Berlin. He also holds a Master of Laws from BPP University, London.